Owen Williams is tackled by Dougie Fife of Edinburgh. Owen Williams has been flown home from Singapore and is now in hospital in Cardiff. The Cardiff Blues centre, who suffered a "significant injury" to his cervical vertebrae and spinal cord, was transferred by air ambulance at the weekend. Four-times capped Williams is at University Hospital of Wales, Cardiff. The 22-year-old was injured while playing for the region at the World Club 10s in Singapore. In a statement, the Blues said the club and the Williams family "would like to take this opportunity to pay tribute to all the staff and specialists at Tan Tock Seng Hospital in Singapore for their care and support for Owen following his injury". It added: "Owen and his family would also like to thank well-wishers for the overwhelming messages of support they continue to receive on a daily basis from around the rugby world." 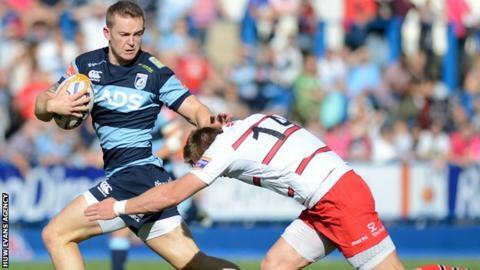 The Wales international was injured in the first half of the Blues' 26-17 defeat to Asia Pacific Dragons in the third-place play-off. Following his injury, people took to Twitter to send messages of support using the hashtag #StayStrongForOws. The British and Irish Lions tweeted: "Welcome home and best wishes to Owen, Cardiff Blues and Welsh Rugby Union from all at Lions Official." Fellow Blues centre Richard Smith wrote: "Great to hear Owen is back home. Looking forward to paying you a visit soon brother!" Williams came through the Blues academy system after being spotted playing for Neath College. He signed for the senior side in 2010, but only made nine Blues appearances last season because of a hamstring problem. The former Aberdare RFC player was capped by Wales at under-16 and under-20 level and made his senior debut against Japan in June 2013.